Northwestern celebrates winning the "Land of Lincoln" trophy after the Wildcats defeated Illinois on November 28, 2015 in Chicago, Illinois. Northwestern has plenty to celebrate. The Wildcats football team, far from a traditional powerhouse, finished the regular season with a 10-2 record, and earned a trip to the Outback Bowl on New Year’s Day. And though Northwestern fell short of a national championship, its football team took another prestigious title: best in the classroom, according to an annual academic ranking of the top 25 football teams. As it did last year, New America compiled the rankings by beginning with each school’s football graduation success rate (GSR). The GSR is an NCAA measure that, unlike the federal graduation rate, doesn’t penalize schools for having players who transfer or leave for the pros–as long as those players depart in good academic standing. The higher the school’s graduation success rate, the higher they start out in New America’s rankings. Schools lose points for graduating football players at different rates than their overall male student body. To compare players to students, New America relied on federal rates, since there’s no GSR for the general population. (Since Navy, ranked no. 21 in football, does not provide a federal rate, the Midshipmen were excluded from these rankings). The bigger the discrepancy, the harsher the penalty. It’s important to note that even if a school graduated football players at higher rates than the overall male student population — six schools in the top 25, Alabama, Baylor, Utah, Oklahoma, Houston, and Tennessee did so — the difference was counted as a penalty. Why? New America does not want to reward schools with low overall graduation rates. In fact, schools got an added bonus for having high overall rates. Northwestern rose to the top on the strength of its 97% GSR for football players. 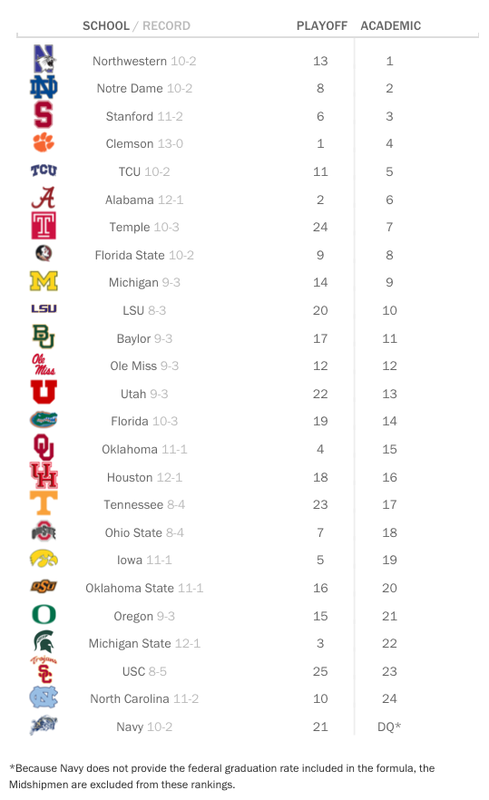 But the biggest winner in these rankings might be Clemson. The country’s top football team finished a very solid fourth in the academic standings, behind scholastic stalwarts Northwestern, Notre Dame and Stanford. The Tigers face Oklahoma, No. 15 in academics, in one national semifinal on New Year’s Eve; Alabama, No. 6 in New America academics, plays Michigan State, No. 22, in the other. Clemson turned in a solid 84% GSR for football, but more importantly, the school graduated football players at the same federal rate (79%) as the rest of the school’s male student body. “This suggests to us that unlike many schools with major college football programs, Clemson is treating the educations of its players and overall students equally,” says Benjamin Barrett, a researcher at New America. The biggest disappointments? The University of North Carolina, whose athletic department has been tainted by a far-reaching academic fraud scandal, finished at the bottom of New America’s academic rankings. The team’s most recent federal graduation rate — 31% — fell way below the 88% rate of UNC’s male students. USC, which finished second-to-last, showed a similar disparity (41% for football players, 90% for the students). “That’s just unacceptable,” says Barrett.